Brian is born on the original Christmas, in the stable next door to Jesus. He spends his life being mistaken for a messiah. After 1975’s Holy Grail marked the first narrative film from Monty Python, the troupe waited four years to return to the screen. They did so with a controversial bang, as 1979’s Life of Brian created a major stir. Which it probably didn’t deserve, as its barbs and mockery don’t really aim at religious icons. When the Three Wise Men (John Cleese, Graham Chapman, Michael Palin) come to Jerusalem, they offer gifts to a newborn they believe to be the messiah. However, they quickly realize they visited the wrong location, so baby Brian gets left in anonymity with his mother Mandy (Terry Jones). 33 years later, Jesus makes a name for himself while Brian (Chapman) and his mother struggle to work their way through a society dominated by Romans. Along the way, Brian finds himself attached to those who rebel against Roman authority – and eventually viewed as the messiah as well. As I mentioned, Brian didn’t merit the negative attention it received in 1979. Truthfully, there's nothing anti-God or anti-Jesus in the movie; the few glimpses we have of Jesus are all totally benign in their treatment of the character. However, the same cannot be said for the way the film treats organized religion. B rian heavily mocks these groups, though in a nonspecific manner. Since Catholics, Protestants, and all the other Christian sects didn't exist during the time period the movie covers, the Pythons couldn't formally address them. However, the Pythons didn't need to name names to make their point, and Brian scores points in regard to the pettiness and absurdity that can follow such organizations. While religious groups have certainly been responsible for a lot of good throughout history, they've also carried out a lot of nastiness and hatred all in the name of God. It's that side of the equation – the manner in which the messengers distort and lose the message - that often becomes the concern here. Of course, this does remains a Monty Python film, so don't expect a serious discourse on these issues. Indeed, the Pythons raise their points through comedy so they don't beat us over the head with these messages. Instead, we see a witty, clever and irreverent look at an alternate history that features a man named Brian who just happened to be born on the same day and in the same place as Christ. The Pythons always produced inconsistent work, and Brian offers no exception. Some parts delight, while some seem pretty spotty. Still, the movie maintains a fairly high standard throughout and lacks any genuinely lame sequences. The Pythons toss a lot of material at the wall and most of it sticks. Mainly because the Pythons worked so well as an ensemble, we find no real standout among the film’s actors. Brian receives the most screentime of any character, but I don't think Chapman spends more time on screen than any of the other Pythons. The difference is that the others play a number of different and hilarious minor roles, whereas Chapman sticks mainly to Brian, a character who acts mainly as a straight man. Happily, Chapman does get to play one juicy role: that of the lisping Roman Biggus Dickus. Ah, Biggus Dickus - that reminds me of one of the most amazing qualities of Python productions. When they were “on”, the Pythons - as with the better episodes of South Park or Beavis and Butthead - could mine extremely crude subjects for laughs. Suffice it to say that some of the jokes of Brian are quite cheap, but many are also quite funny. Part of the reason stems from the charm of the performers, and all the Pythons do well here. Again, none really stand out as better than the others, but that's more due to the interrelated and complementary natures of their performances. The Pythons had something terrific much in the same way as the crew behind SCTV. They all were together so long that they knew each others strengths and weaknesses intimately, so the entire group organism could function well. And that's the case with Brian. Certainly some of their TV sketches were funnier than parts of this film, but the movie sustains a strong narrative and makes some excellent points through its comedy. Were one so inclined, one could neatly dissect the film and closely examine all these different lobs and volleys and more fully explore what the Pythons said, but I’ll leave that form of analysis to others. I'll just finish with this: Life of Brian is a damned funny and entertaining little film. There! 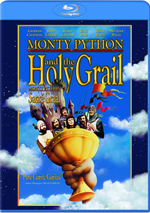 Monty Python’s Life of Brian appears in an aspect ratio of approximately 1.85:1 on this Blu-Ray Disc. On the surface, the image boasted a lot of strengths, but it came with notable weaknesses that marred the presentation. The main complaint related to techniques to “improve” the messy source material. Brian tended to be a very grainy flick, so the Powers That Be decided to “fix” this. That meant techniques that got rid of much grain – and kept some in awkward form. Although grain appeared throughout the film, it tended to be “frozen”; the grain seemed to remain in place, and that gave the movie an odd, unnatural appearance. Which was a shame, as so much of the image otherwise looked good. Sharpness usually seemed nice. Some instances of softness appeared – occasionally exacerbated by the noise reduction artifacts – but the image was usually pretty accurate and well-defined. I noticed no issues with jaggies or shimmering, but some light edge haloes appeared. Source flaws remained minor, as only a handful of small marks occurred. Colors were quite strong. Skin tones could be a bit reddish, but I thought that reflected the source. Overall, the hues were pretty peppy and haven’t looked better. Blacks were a bit mushy at times, but they also could be fairly dark, and shadows showed fair delineation. Enough of Brian looked impressive to make this a “C” image, but the issues with noise reduction and grain meant it didn’t look especially film-like at times. The film’s Dolby TrueHD 5.1 soundtrack also had its ups and downs. The soundscape didn’t have a ton to offer, as it remained restrained. Music broadened with mild stereo presence, and some effects came from the side and rear channels, but nothing exceptional occurred. Given the movie’s age and origins, that didn’t surprise me, so I was fine with the limited soundscape. Audio quality was also erratic. Dialogue was intelligible but could be rough and edgy; the lines didn’t tend to be especially natural. The same went for effects; some were reasonably clear, but others were boomy and distorted. Finally, music showed more inconsistencies. Some of those elements showed decent range/clarity, but others were flawed; for instance, the title song was awfully rough and shrill. Though not a bad track, the audio was too inconsistent to deserve more than a “C”. How did the Blu-ray compare to the Criterion DVD from 1999? Despite their inconsistencies, both picture and audio improved on the problematic DVD. That’s more a criticism of the Criterion disc, though, than an endorsement of the Blu-ray. This is a spotty presentation but it beats the ugly visuals and sound of the DVD. Despite occasional lulls, this becomes a good discussion. We get a nice look at various filmmaking choices as well as how the Pythons work together and performance elements. The various sides mesh in a positive manner to create a lively and enjoyable piece. For the second commentary, we hear from actors John Cleese and Michael Palin. Both created their own screen-specific tracks that got edited together into one piece. They look at subjects mainly related to story/characters/script and cast/performances, though other facets of the production arise as well. While not quite as strong as the first commentary, Cleese and Palin still manage to deliver a nice examination of the movie. They get into matters from their perspective, and these notes add to our understanding of the production. This turns into another fine chat. A modern documentary called The Story of Brian goes for 59 minutes, 51 seconds and provides info from Jones, Gilliam, Idle, Palin, Cleese, Monty Python: The Case Against author Robert Hewison, MediaWatch-UK’s John Beyer, lawyer Sir John Mortimer, former EMI Films managing director Michael Deeley, producers George Harrison (from 1988) and John Goldstone, first assistant director Jonathan Benson, Methuen Publishing’s Geoffrey Strachan, Muslim Council of Great Britain’s Inayat Bunglawala, and film critics Derek Malcolm and Kenneth Turan. They discuss their background in religion and the film’s origins/development. They also get into research, script/story/character topics, locations, cast and performances, financing complications, aspects of the shoot, music and songs. We also cover controversies related to the movie’s content/release and the public reaction to it. With two commentaries behind us, we already got some of this material. However, I don’t think we find a lot of redundant information, as “Story” digs into a variety of new notes. I especially like its concentration on the controversies – and we also get some excellent archival footage. From start to finish, “Story” offers a fine documentary. For another new feature, we find a Script Read-Through. This runs one hour, 50 minutes and 48 seconds as it takes us back to the late 1970s. We see some storyboards and script as we hear an audio recording that lets us eavesdrop on a cast reading of an early screenplay. Nearly two hours of this fairly dry rendition might be a bit much, but I’m happy to have the option to examine it; it’s a cool look at the source material. Five Deleted Scenes last a total of 13 minutes, 16 seconds. We find “Shepherds”, “Pilate’s Wife”, “Otto”, “The Sign That Is the Sign” and “Souvenir Salesman”. These tend to be comedic pieces that offer entertainment but don’t seem essential to the story. They’re fun to see but inconsequential. Each scene can be watched with or without commentary. For “Sheep” and “Wife”, we hear from Idle and Jones, while for “Otto” we get Gilliam and Idle. “Shop” delivers Idle on his own and we get no commentary for “Sign”. They give us some basics about the scenes but their remarks don’t bring a ton of insight. By the way, these are the same deleted scenes from the Criterion DVD, though some feature slightly different titles here. Oddly, the Blu-ray drops the Jones commentary for “Sign”. A Photo Gallery delivers a running collection of pictures. It lasts one minute, 47 seconds and shows shots from the movie and the set. It brings us a decent batch of photos. Under Trailers, we find promos for and then-upcoming Blu-rays. No trailer for Brian shows up here, but we do get four radio spots. 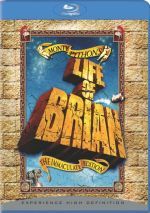 While probably not Monty Python’s best work, Life of Brian offers a quality affair nonetheless. It gives us enough irreverent wit to make it entertaining. The Blu-ray presents spotty picture and audio along with a good collection of supplements. Though this never becomes a great Blu-ray, the movie works well and turns this into a nice addition to the collection of every Python buff.